Outdoor spaces can be complemented by a number of structures but there are few that can beat the exciting warmth fire pit bring regardless of the season. Fire pit has the knack for enflaming emphatic conversations among your family members and guests as they unwind and catch up. It can spark that cozy feeling, right at your backyard, keeping your compadres warm long after the sunset. However, it’s always a hassle figuring out where to start. Many end up scratching their heads trying to decide where to place it in their outdoor spaces, whether to burrow it in the yard or raise it on the patio, if they can get them from stores or just DIY it among other considerations. You might also opt to consult a contractor to guide you on how best you can blend your style with the native setting of Calgary. 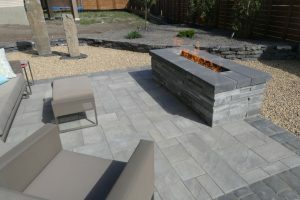 But moving forward, we will look at some of the fire pit design ideas and some recommended tips and tricks when creating a dynamic and mind-boggling fire pit in Calgary. 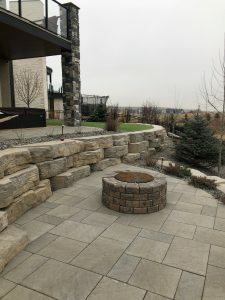 Outdoor entertaining space starts with your line of thoughts and if you gather the right ideas, you may end up creating the ultimate fire pit in your neighborhood. Here are some of the ideas you might arm yourself with before placing that blueprint on the table to install your fire place. It will nudge you into carving the fire pit layout and area that you may be most comfortable with. Also, select fire pit materials that go hand in hand with your surroundings. If you are on a budget you could consider playing your patio on on your lawn. In this way, you will make use of unexploited covers of grass would be a great spot picnic blankets and outdoor furniture, all gorgeously surrounding the pit. This is solely because it’s a press away from starting your fire and cleaning is a breeze. Many of our fire pit packages come with a remote control. However, this smart alternative may deprive you of the nostalgia burning wood brings through crackling sound and that unique smoky air. It’s still easy to roast your marshmallows using your natural gas. Wood burning fire pits are still a great option if you want an authentic fire pit and they are much less costly than natural gas fire pits. 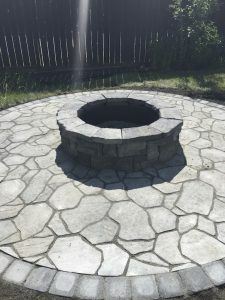 Also, you can have the fire pit permanently or temporary installed and even purchase a portable one that would be easy to move around your yard. For the built-in fire pit, you can decide on building materials like concrete, mortar, bricks and stone. Contact us today for your free estimate and landscaping consultation.